What is the Statue of Zeus at Olympia? The Statue of Zeus at Olympia is considered a part of the collection for the Seven Wonders of the Ancient World. The wonder depicted the likeness of the Greek god Zeus, whom was regarded as one of the most important and powerful gods within Greek mythology. The statue was seven times the height of the average male, it would have been the one of the tallest statues in the Mediterranean world. The Statue of Zeus at Olympia was the statue that was honored in the first Olympic Games. Greek mythology is riddled with myths. The original myth told that the altar of Zeus stood in the exact area that a thunderbolt had struck, a thunderbolt that had been hurled to Earth from Mount Olympus by Zeus himself. Many altars graced houses throughout the whole of Greece, and pilgrimages were made to shrines such as the Temple of Zeus. The Temple of Zeus was believed to have been built in a blessed grove nestled between the two rivers of Olympia on the western coast of Greece. The city, Olympia wasn’t just the house of the Temple of Zeus or the Statue of Zeus at Olympia, it was also the location of the first Olympic Games, for which Zeus is the patron god. It is believed that the first games were in 776 BC and were held every fourth year, just as they are today. The origins of the Olympic Games falls within religion. The Olympic Games were played to honor Zeus. 466-456 BC saw the development and creation of the Temple of Zeus. The temple was constructed by Libon, a famous architect of the time, in the classic Doric style. 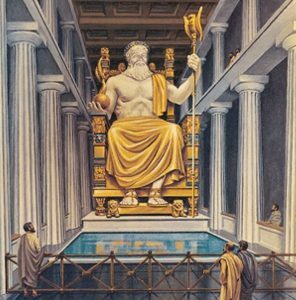 The Greeks of the time didn’t believe that the temple alone was enough to appease Zeus so they commissioned a statue to be erected in the temple to honor the god. 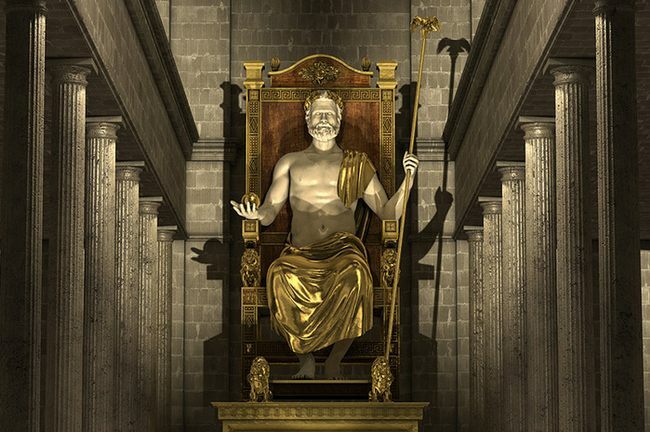 The Statue of Zeus was created in 430 BC by the Greek sculptor Phidias. Phidias is highly regarded as the most famous sculptor in ancient Greece. The statue took years to complete and is included as one of his two great masterpieces with the other masterpiece being the statue of Athena in the Parthenon. The statue measured 13m tall (42 feet), 6m wide (21 feet), and had a perimeter of 13m (43 feet). 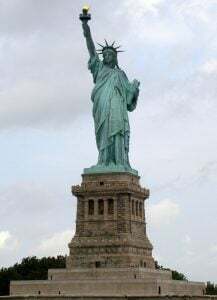 The statue was constructed from a wooden frame that was covered in expensive materials for the time. These materials included: gold, ebony, ivory, silver, and precious stones. Historical accounts say that his hair and beard were made from gold and that his unclothed flesh was rendered in ivory. His sandals and robe were constructed from gold. The stool beneath his feet were upheld by two golden lions. In his left hand he held a scepter that gave him dominion over the Earth. Olive oil was used to clean the statue daily in order to keep the ivory in good condition. It is unclear the exact circumstances that led to the destruction and loss of the Statue of Zeus at Olympia. Some accounts depict that the Roman Emperor Caligula gave the order for the statue to be removed from Greece and relocated to Rome so that it could be refashioned in his image. However, before Emperor Caligula could have the statues moved, he was assassinated. 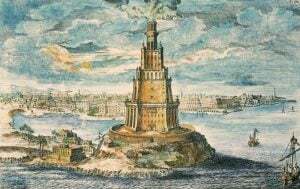 Another account depicted through the writings of historian Georgios Kedrenos, states that the statue was removed from Olympia and resettled in Constantinople. It is unclear if the statue perished in the great fire that ravaged the Palace of Lausus in AD 475 or if the temple and statue burnt down during the year AD 425. The only consistent thing that historians can agree on is that the Statue of Zeus at Olympia perished in an unprecedented fire.